Aparna Nancherla started out doing comedy in her hometown of Washington D.C. and now resides in New York City. Elle’s 2016 “Women in Comedy Issue,” featured her as one of the most exciting new voices to hit the comedy scene. Aparna is a series regular in the debut season of Comedy Central’s Corporate and has reprised her role in season 2 of HBO’s Crashing. She is also featured in the second season of Netflix’s The Standups. Other television credits include Netflix’s Master of None and Love, HBO’s High Maintenance, Comedy Central’s Inside Amy Schumer, appearing as a US correspondent for Dave’s (UK) Unspun with Matt Forde, and Hulu’s I Love You, America with Sarah Silverman. In 2018 Aparna makes her feature debut in the Paul Feig movie A Simple Favor. Her TV stand-up appearances include Seeso’s stand-up series Night Train with Wyatt Cenac, season 2 of Comedy Central’s Meltdown, as well as Adam Devine’s House Party. 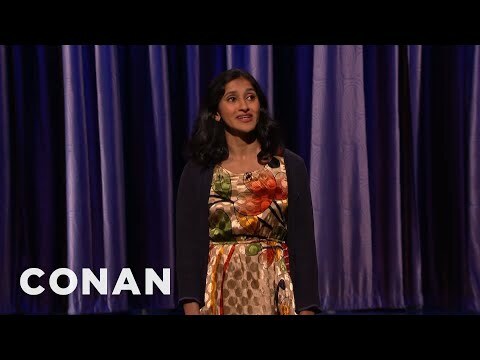 In 2013, Aparna made her late night stand-up debut on TBS’s Conan and was one of the breakout New Faces at the prestigious Just For Laughs Festival in Montreal. Her TV writing credits include Late Night with Seth Meyers, as well as being a regular correspondent/writer on FX’s Totally Biased with W. Kamau Bell. She is also an alumna of the NBC Stand Up for Diversity program and currently headlines throughout the world and has been seen at a number of festivals. Aparna’s been featured on and in NPR, Reader’s Digest, The Huffington Post, The Washington Post Magazine, XM Radio, and Slate V. Her debut album Just Putting It Out There was released in July 2016 by Tig Notaro’s label Bentzen Ball Records and hit the #4 on Billboard Comedy Charts.